I love to watch NBC Nightly News. But this app is never kept up to date. As a result, the broadcasts available to watch are days behind and consistently never updated. It baffles me that a highly respected news organization cannot find a way to keep the content updated daily. I love the show, but it gets really old to pull up the app and have news from days ago. I’ll be finding another news source. Very disappointing. News goes DAYS without ever updating! Regardless of how many times one completes this APPs "fix it" form, whoever manages the APP, fails to fix the issue of the news updating! This mostly occurs on weekends so one attempts to read the "NEWS" only to find the news is unchanged from Thursday or Friday, through to Tuesday! What good is a News APP with a smattering of news from maybe Tuesday through Thursday? That is not NEWS, but SNOOZE! Additionally, The so-called news is just fairy-tales through rose-colored glasses! The format needs to be changed; it needs to be hard-charging and hard-edged! 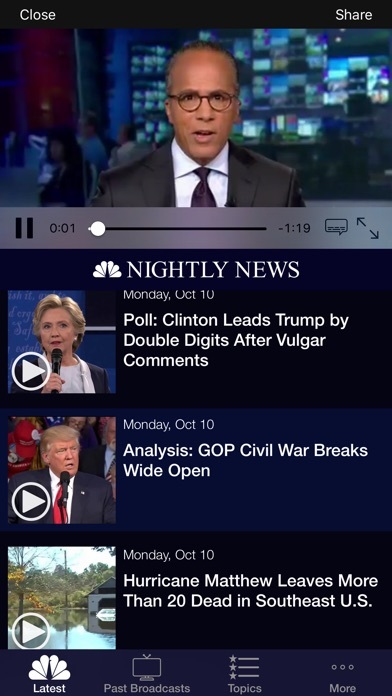 NBC NEWS as it is currently presented in this APP, tells me that NBC spends more on its anchors than it does on reporting and investigating. Clean up your act, NBC! This app won’t update since Friends 11/17. This App is unless too many ads. Good bye! Post Full episodes on Time! I don't get it! It says Full broadcast at 10:00est, but this NEVER happens! Right now it's 11:15 pm est and the Full broadcast still is not available! So frustrating! This app has been very glitchy for some time. When opening the app to read the news, the screen is blank with bare headlines outlined. The app can take up to a minute to load before anything can be read. Even once the app is loaded, it can still lock up when reading a story and not being able to scroll up or down. I like NBC news but using this app is frustrating. I'm still hoping it gets fixed.